Bullseye! Right Sarah Palin & Jesse Kelly. One Down in Arizona Massacre 19 to Go. Only it wasn’t just one down. It was 18 with 6 dead including a 9 year-old little girl. 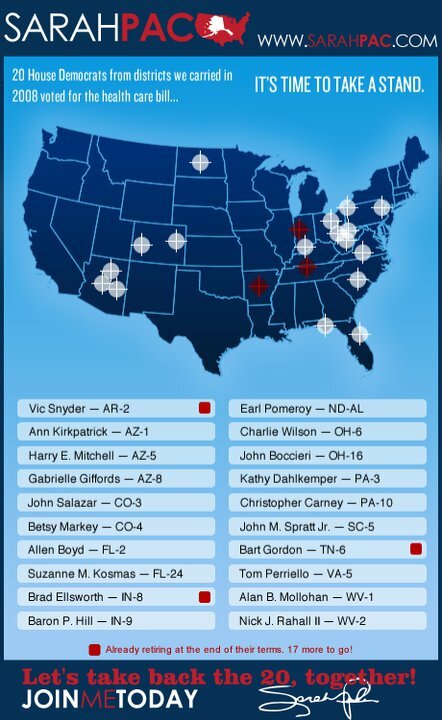 Palin put this Gun Sight On Democrat “Target” Map on her Facebook page. Don’t Retreat, Instead RE-LOAD! By Saturday afternoon it had been removed. WHY? Why not leave it there you sick demented S.O.B.? I mean after all the very viable candidate that your followers seem to think you are for the Presidency of our country for 2012 love you. They didn’t mind it there before Saturday’s Massacre that left 18 shot and 6 dead including a 9-year old little girl who had been elected to her School’s Council. No doubt she had more intelligence, more common sense and more of a heart than Sarah Palin or Jesse Kelly will ever have. And as you can see Rep. Gabrielle Giffords of Arizona is the fourth name on the list of this Hideous Map. As sickening as it is sadly Rep. Gifford number came up Saturday Afternoon when she was shot in the head by a twisted nobody. That nobody’s name Jared Loughner 22-years-old. From his ramblings on several You Tube Video’s they seem to mimic David Wynn Miller almost identical on the Language Rant and Currancy Gold rant. FOR THE PEOPLE OF THE WRONG-SYNTAX-COMMUNICATION-TEACHINGS ARE WITH THE CLAIM OF THE TEACHINGS WITH THE LODIO-CONTRACT-VOID = AILING BY THE RULING-CLASS, GOV, KING, QUEEN, JUDGE, ATTORNEY, LAWYER, TEACHER, PRIEST, DOCTOR AND [PEOPLE JUST DO NOT KNOW!!!] OF EVERY-NATION ON EARTH WITH THE SLAVERY OF THE PEOPLE WITH THE CONTROL OF THE LICENSING-USURY AND TAXATION OF THE WATER, AIR, EARTH AND FIRE. FOR THE CORRECTION OF THESE WRONGS IS WITH THE CLAIM OF THIS NO-CITIZEN=UNITED(ADJECTIVE) STATES(PRONOUN) OF(ADVERB) AMERICA(VERB-FICTION) WITH THE LAW OF THE TITLE~42: C.-S.-C.-S.-~1986 FOR THE KNOWLEDGE OF THE LAW AND FACTS AND WITH THE RIGHT OF THE CORRECTION WITH THE VOIDANCE OF THE PERJURY BY THE CITIZEN. Sovereign citizen ideology justifies these goals by claiming that at one time there was an American utopia governed by English “common law,” a utopia in which every citizen was a “sovereign,” and there were no oppressive laws, taxes, regulations or court orders. However, a conspiracy gradually subverted this system, replacing it with an illegitimate successor. Different sovereign citizen theorists have varying versions of this progression, but most include the following elements: the alleged suppression of a “missing” 13th Amendment that would have disallowed citizenship for attorneys; the Reconstruction amendments; the 16th Amendment (allowing an income tax); the 17th Amendment (allowing popular election of senators); the Federal Reserve Act and the 1933 removal of United States currency from the gold standard. By that time, many sovereign citizen theorists agree, the United States government was completely illegitimate, using emergency war powers and other unlawful measures to rule unconstitutionally. The filing of frivolous lawsuits and liens against public officials, law enforcement officers and private citizens, on the other hand, has remained a favorite harassing strategy. These paper “attacks” intimidate their targets and have the beneficial side effect of clogging up a court system that sovereign citizens believe is illegitimate. Frivolous liens became such a problem in the 1990s that a majority of states were forced to pass new laws to make filing them illegal, their removal easier, or both. Today, eager sovereign citizens can use the Internet to download a variety of boilerplate forms and documents to wield against the government. More adventurous types can matriculate at “schools” such as the Erwin Rommel School of Law; additionally, a number of activists, ranging from David Wynn Miller to The Aware Group, hold seminars around the country to teach people — for a price — about the latest tactics and weapons. The English Language Has Been Deliberately Modified to Enslave Us! David Wynn Miller is a Right-Wing Extremist Loon. Also an atheist that said Jesus spoke FICTION. Take your pick of articles. The parents of another young man by the name of Russell Gould said their son was brainwashed by Miller. “Russell has been seven years with David Wynn Miller, and he has different beliefs about the legal system. You have Jared Loughner’s Philosophy teacher and Mentor here. And with the likes of these Tea Partiers who rant against this Present Administration with the rants of Take The Country Back. Then to have their main focus and Mentor for whatever brainless reason posting Gun Target ‘s on a Map of Democrats. This is all it takes for an already warped and twisted mind. All I know is Jared Loughner’s ramblings make about as much sense as David Wynn Miller’s. And now Sarah Palin has removed these Cross Hairs on Democrats from her Face Book Page. But not until 18 people were shot with the fourth name on her list being one of them. 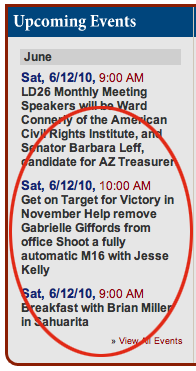 Even back in June 2010, Rep. Gabrielle Gifford’s (D-AZ) Republican opponent and Tea Party candidate Jesse Kelly had an event at which voters could shoot an assault rifle with the candidate, promoted as thus: Get on Target for Victory in November Help remove Gabrielle Giffords from office Shoot a fully automatic M16 with Jesse Kelly. And now there are those that don’t want any similarities connected to the State of Mind that they themselves inflicted upon those that follow their twisted views, like those who follow David Wynn Miller. Well I’m sorry people but pictures speak louder than any words. How could these pictures not be a symbolic link straight to the minds who share their views. Are these people Christians? Would Jesus Christ preach and post such things. I personally do not know of any Democrats who hold office in any political arena or who may run for any type of office with Maps with Targets on people. And say boldly KEEP THE TARGETS THERE. Well Saturday these people got their wish. Gabriel Zimmerman, 30, was Giffords’ director of community outreach. Dorwin Stoddard, 76, was the pastor at Mountain Ave. Church of Christ. 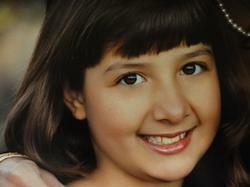 The 9-year-old girl was Christina Greene who was a student at Mesa Verde Elementary. And My God, she was born September 11, 2001. The day Muslim Extremists took the lives of so many that started the War on Terror. We’ve lost countless troops lives fighting abroad in the Middle East, yet we cannot stop our own home-grown Terrorists. The Timothy McVeigh – Jared Loughner Right-Wing Extremist types. Against the Government enough to kill anybody with-in their view. Even children. A neighbor was going to the Giffords event and invited Christina along because she thought she would enjoy it, said her uncle, Greg Segalini.Christina had just been elected to the student council at her school. The event, held outside a Safeway supermarket north of Tucson, was an opportunity for constituents to meet Giffords and talk about any concerns they had related to the federal government. Everyone except 9-year-old Christina Greene was pronounced dead at the scene. Greene was transported to University Medical Center where she was later pronounced dead. How utterly saddening and heart breaking. Rep. Gabrielle Giffords is still in critical condition. I’ve gone all over the internet trying to get the names of the others shot at Saturday’s Congress on your corner in Arizona. 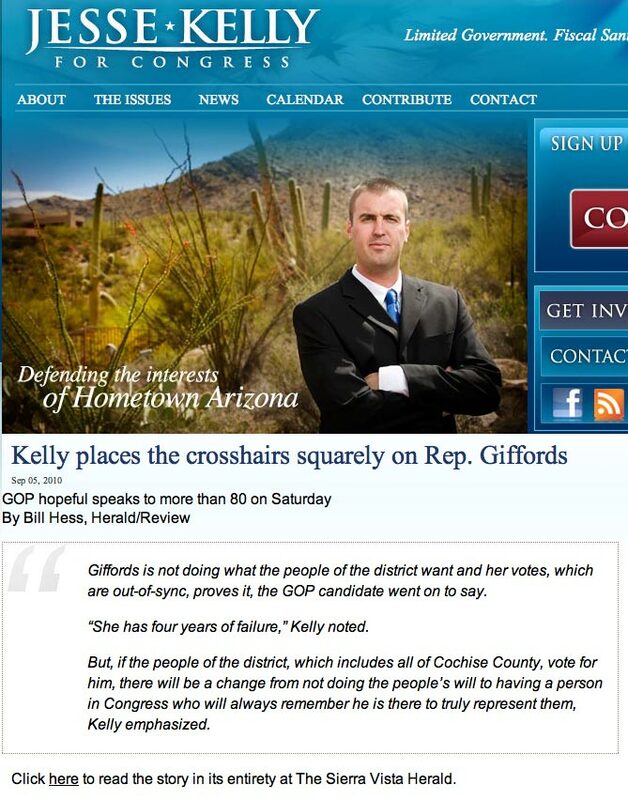 Giffords spokesman C.J. Karamargin said three Giffords staffers were shot in the attack. One died, and the other two are expected to survive. GOD SPEED TO EACH AND EVERY SINGLE INDIVIDUAL OF THESE VICTIMS, THEIR FAMILIES AND FRIENDS. ” RIGHT TO LIFE “. Article pretty much tells the tale of who they supported. All you keep hearing is how this 22 year-old just isn’t all there. Mentally ill and deranged. And I have no arguments there. He might have had no political motives in any respect. But how can you consider a couple of Politicians who have a Map apart of their web sites with targets of Cross Hairs on specific people all being Democrats and all across the country. With one wanting people to show up on a day in June 2010 to shoot off fully loaded automatic M-16s. Do you consider these disgusting displays not as abnormal or not all there and mentally ill and if not. WHY?